My first encounter with a bull was at our farm in upstate New York. We used to rent out land to local farmers to house livestock like horses and cows. The curious kid that I was, I hopped one of the fences with my sister to play with the cows. We were petting the cows for a while until we heard screams back near the house; It was our mother screaming and flailing her arms. It turns out that the black cows with horns are actually bulls. I learned the importance of animal distinction that day. Along those lines, the new lean meat grazing our grocery store shelves and plastering our food magazines, bison, is often mistaken for buffalo. So watch what you eat or you might get pierced by a bull. 1. Shape into 2 patties, packing as lightly as possible to keep the moisture in. Preheat the grill to 400 degrees or a pan to medium-high. Sprinkle the top of the burgers with salt and pepper and place salt-and-pepper-side down onto the grill/pan. After 2-3 minutes, flip the burgers and top with more salt and pepper. Cook for an additional 2 minutes, adding cheese, if desired, for the last 30 seconds of cooking time. 2. Spread peanut sauce on one side of bread or cabbage leaf, top with the burger and any additional toppings. I still have nightmares about that day! He was one nasty bull. However, the burgers look great! What is the nutrition like for bison? Is it very dry? I have to look for it in my grocery. I use ground bison quite a bit, but do think it’s a bit dry. I do like the lower fat content though. It’s pretty expensive around here. For ground, it’s $6.29 per pound. I’ve never bought the bison steaks, but I know they are more. Yea, and it will continue to stay expensive unless it becomes as widespread as beef, which is highly unlikely. I have not tried store-bought ground bison but grinding my own was incredibly juicy. I overcooked the burgers and they still came out tender and basically fell apart. 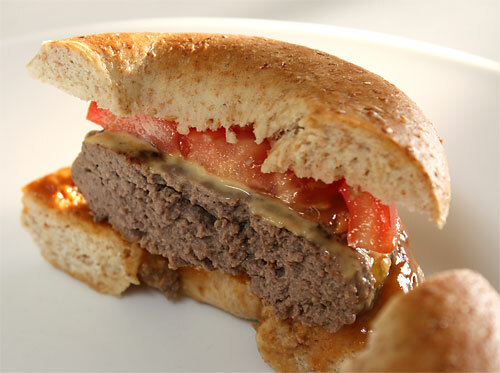 you’re blowing my mind with this totally non traditional burger! it looks yummy!! but i’m not sure i could give up my tomato, cheddar and ketchup!! Throw it on then! I used american cheese and tomato and dipped it in ketchup! I did skip the lettuce though, for some reason I wasn’t feeling it. hmm, i thought they were the same thing. o well, this is one tasty burger with that peanut sauce! interesting! i recently had my first bison burger while vacationing in south dakota. Bison burgers are so much better than the regular kind! I like the idea of peanut sauce on it. …and now I’m envisioning some kind of “man vs. nature” thing going on here. Beginning with you petting cows. Ending with you eating a burger. Oh my. Haha, lucky for me man won that round. As a born South Dakotan, I am very familiar with bison meat. Free-grazing, organic bison meat is abundant here. I love peanut sauce on anything, but I would say that bison meat should be appreciated for what it is and not over-condiment-ed. Lettuce, tomato and maybe a mild cheese is about as far as I would go with ground bison. I would however love to try this with a beef burger with a side of my sweet potato fries and sweet Thai chili sauce.